Georgi Cenov, a man with an intellectual disability, takes his fight to the European Court of Human Rights (ECtHR) having been held in Bulgarian institutions against his will for 28 years. This case, which is supported by MDAC and lawyer Aneta Genova, highlights the lack of services for persons with disabilities in Bulgaria to live independent lives. Today, over 7,000 people with disabilities continue to be institutionalised in the country. 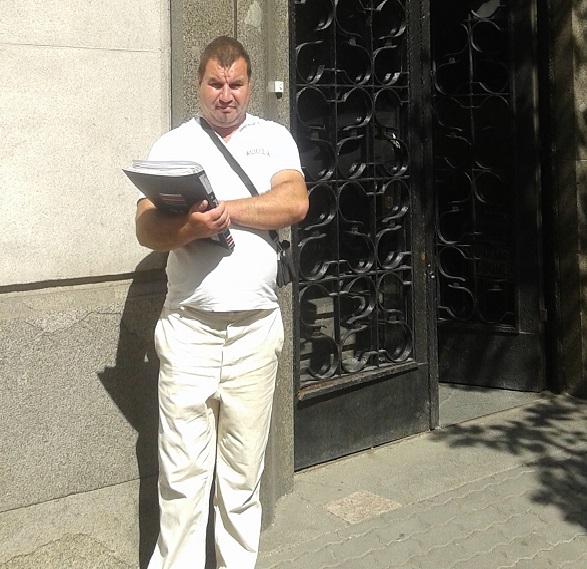 Georgi Cenov outside Bulgarian Supreme Court, 2015. © MDAC. During his time in Podgumer, Mr. Cenov was under full guardianship: his legal capacity had been removed and he was not permitted to make any legal decisions. In addition, the regime of the institution prevented him from making everyday life choices for himself, like managing finances, or choosing what to eat and how to spend his free time. He also couldn’t make decisions on healthcare - he was regularly forced to take harmful medication against his will. A nurse at the institution at the time defended the restrictions placed on residents, saying that if patients were allowed out of dormitories, “they run away”. Georgi Cenov attempted to escape Podgumer on multiple occasions, only to be returned against his will by police. After five years, Mr. Cenov was finally able to secure his release in 2007. MDAC and lawyer Aneta Genova began legal action for restoration of Mr. Cenov’s legal capacity which was eventually granted in 2008. Since then, Mr. Cenov has tried to rebuild his life in the community, yet the Bulgarian Government have neither acknowledged the abuses he suffered during decades of institutionalisation nor have provided him with support to live independently. With no further legal avenues available to Mr. Cenov in Bulgaria, MDAC and lawyer Aneta Genova have initiated legal action at the European Court of Human Rights (ECtHR). The claim focuses on the obligation of the Government to ensure respect for Georgi’s right to a private and home life which is protected under Article 8 of the European Convention on Human Rights. Commenting on the case, Mr. Cenov said: “My dream is to have a home in the community – no one deserves to be without a home”. The case is being taken under MDAC’s “My Home, My Choice” campaign which seeks an end to disability-based institutionalisation, and calls on governments to take concrete steps to ensure that persons with disabilities can live with dignity and independence in the community. The right to independent living in the community is further guaranteed under Article 19 of the UN Convention on the Rights of Persons with Disabilities (CRPD) which was ratified by Bulgaria in 2012. The development comes following repeated criticism of Bulgaria’s segregation and isolation of persons with disabilities, including ECtHR judgments in the cases of Rusi Stanev and Stefan Stankov. MDAC calls on the Bulgarian Government to close disability institutions and instead invest in the development of quality services which facilitate independence and inclusion. MDAC further reiterates its call for Bulgaria’s outdated guardianship system to be abolished and replaced with supports for people to exercise their autonomy. This year, the UN Committee on the Rights of Persons with Disabilities is developing guidelines (known as a “General Comment”) for governments on implementing Article 19 of the CRPD. See our special resources page for more information.